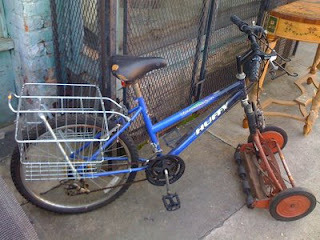 Hey it looks like an interesting idea - a push mower attached to the front of a bike. I wonder if it works. Probably does. Not sure why you would need to be riding a bike. Wouldnt it just be easier to push the mower as it was intended. Good for all those people we see riding to work - they can ride on nature strips and cut the grass on the way. Thanks.